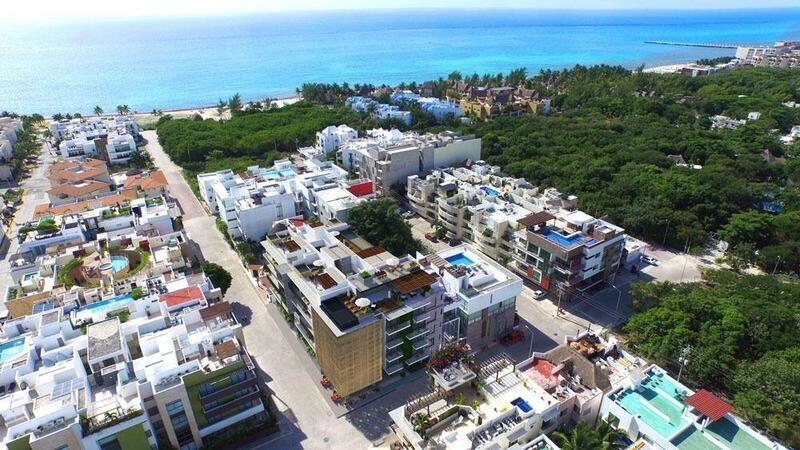 Property with great location in the heart of Playa del Carmen, in a safe and popular area, close to the famous Mamitas Beach and only 3 blocks from the 5th Avenue. This 4 story house of a private comunity is a very good option in Real Estate Playa del Carmen, with great return on investment in long term or vacacional rental. It has 2 apartments + a private roof top with jacuzzi ! The first apartment, built on the two first floors, has 3 bedrooms, 3 bathrooms, 2 balconies, open kitchen & living room. One bedroom offers direct access to the common areas (pool & palapa). The second apartment of the third and forth floor was recently remodelated, modern and minimalist, with 2 spacious bedrooms, 2 bathrooms, open kitchen with an island & living room.